FAIRFIELD — The head of the local GOP has filed a complaint against two Democrats who served in elected positions here despite living in Bridgeport. 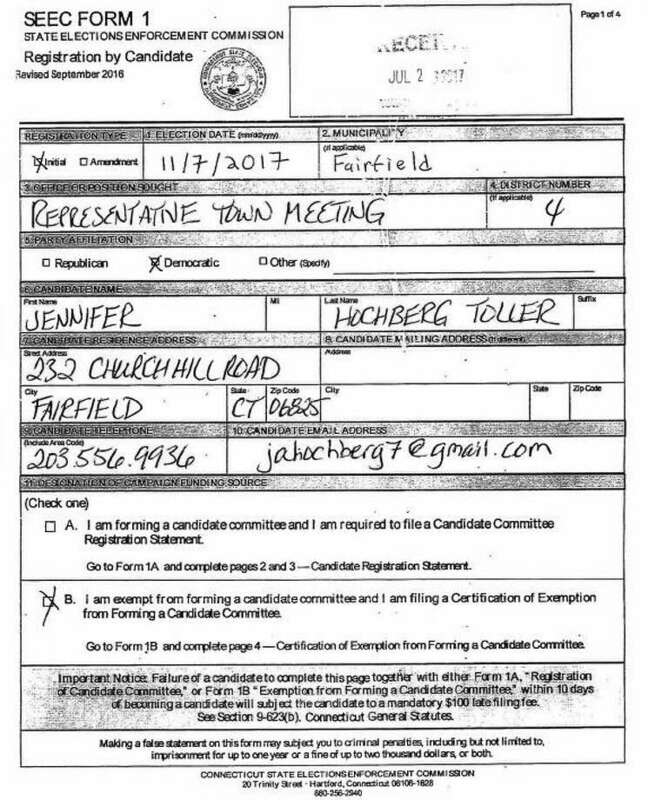 James Millington, chairman of the Republican Town Committee, said the complaint with the State Elections Enforcement Commission against Jennifer Hochberg-Toller and her husband, John Tyson Toller, would be filed Thursday morning. Hochberg-Toller was serving on the Representative Town Meeting from District 4 last summer, when she and her husband moved to Bridgeport from her parents’ Church Hill Road home. She continued to serve, and was on the ballot for Tuesday’s municipal election. Her husband is a justice of the peace, also an elected position. She resigned from the RTM and withdrew from the ballot when her residency became known, John Toller resigned as a justice as of Oct. 30, according to Town Clerk Betsy Browne. In his affidavit, Millington raised the question of Hochberg-Toller’s May1, 2017 vote on a motion to reduce the proposed town budget. The motion, to eliminate an administrative assistant’s position in the Registrar of Voters office and save $60,706, failed when the vote ended in a 20 to 20 tie. Republicans held a 21 to 19 majority on the RTM. Republican Eric Sundman, from District 10, voted “no” with the Democrats on that motion. In addition, the complaint raised the question of the couple signing petitions seeking a special election for the Board of Selectmen, and John Toller’s appearance as a plaintiff on a subsequent lawsuit to force that special election, actions that incurred a cost to taxpayers. To force a special election, 2,031 signatures were needed. The Democratic Town Committee submitted 3,199 signatures to the Town Clerk’s office. However, in addition to signed the petition, John Toller also solicited signatures for the petition drive. Town Attorney Stanton Lesser said he does not believe John Toller as a plaintiff has any impact on the suit because there are four other plaintiffs, all town residents. Democratic Registrar of Voters Matthew Waggner had previously indicated that Hochberg-Toller’s name would simply be blacked out from existing ballots, but said on Thursday that new ballots were ordered. He said the cost will be about $500. Anyone who voted by absentee ballot and wants to redo their absentee ballot can do so at the Town Clerk’s office.